Pretty much everyone knows who David Pecker is these days. Especially in the light that he was granted immunity in the Michael Cohen case the other week. Below is just a small sampling of people having fun over his somewhat unusual last name. Yes, back in the mid ‘90’s, when the idea of Donald Trump being president would’ve caused more laughter than David Pecker’s last name, I was regularly skewering him and making fun of him in my magazine fishwrap. 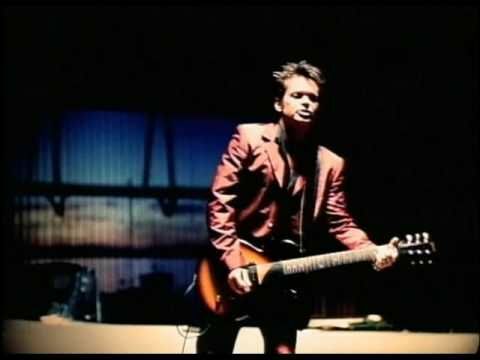 Most people back then had no idea who he was, but because of my magazine and media obsession, I knew all about him. Back then, Pecker ran the company, Hachette Filipacchi Magazines and was instrumental in the trend of advertising guiding editorial policy. Basically, he was the forerunner for dumbing down journalism to make more money. I hated him and used to call him “Peckerhead” in fishwrap. A friend of mine worked for a magazine called Folio:, which was a trade magazine about the magazine industry. He wrote about fishwrap for Folio: and called me one day and asked if I would make fun of a cover story that they were doing on David Pecker. He was pissed they were sucking up to him and he said he’d give me an advance copy. So I happily agreed and below are the results of my labor of hate. This is the cover of the winter 1997 issue of fishwrap that featured the article on David Pecker. It was our “Just Say Dope” issue, so it was perfect! This was also the issue that Michael Moore paid for so it’s irony at its finest moment! If you don’t know the fishwrap/Michael Moore story, click here to read all about it. 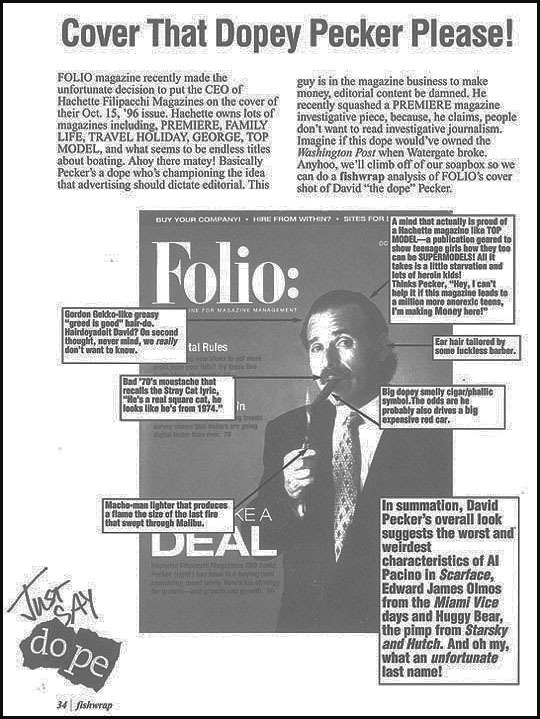 As I said, this was our “Just Say Dope” issue, so the headline is, “Cover That Dopey Pecker" and this is the full page layout with Pecker on the cover of Folio: magazine. This is the introduction to the piece. I’ll re-type it here because it’s a little fuzzy-wuzzy in the scan. Folio: magazine recently made the unfortunate decision to put the CEO of Hachette Filipacchi Magazines on the cover of their Oct. 15, ‘96 issue. Hachette owns lots of magazines including, PREMIERE, FAMILY LIFE, TRAVEL HOLIDAY, GEORGE, TOP MODEL and what seems to be endless titles about boating. Ahoy there matey! Basically Pecker’s a dope who’s championing the idea that advertising should dictate editorial. This guy is in the magazine business to make money, editorial content be damned. He recently squashed a PREMIERE magazine investigative piece, because, he claims, people don’t want to read investigative journalism. Imagine if this dope would’ve owned the Washington Post when Watergate broke. 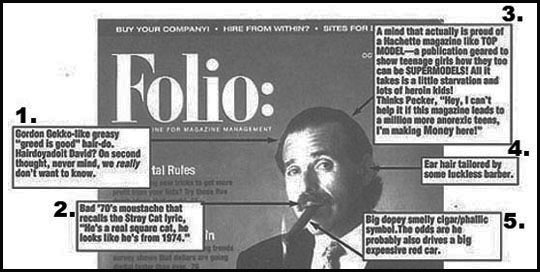 Anyhoo, we’ll climb off our soapbox so we can do a fishwrap analysis of FOLIO’s cover shot of David “the dope” Pecker. This is the top section of me breaking down this cover photo of this creep. 1. Gordon Gekko-like greasy “greed is good” hair-do. Hairdoyadoit David? On second thought, never mind, we really don’t want to know. 4. Ear hair tailored by some luckless barber. 5. Big dopey smelly cigar/phallic symbol. The odds are he probably also drives a big expensive car. Here’s the bottom section and the conclusion. 1. Macho-man lighter that produces a flame the size of the last fire that swept through Malibu. 2. 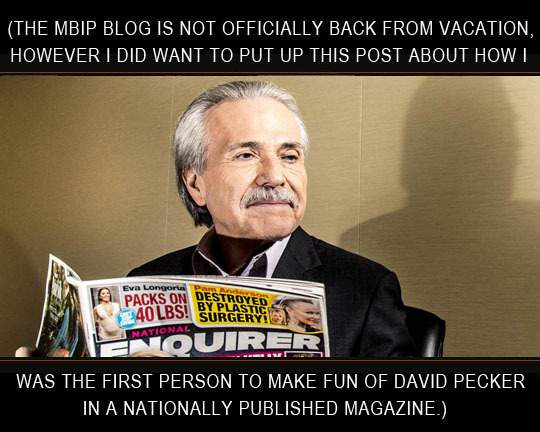 In summation, David Pecker’s overall look suggests the worst and weirdest characteristics of Al Pacino in Scarface, Edward James Olmos from the Miami Vice days and Huggy Bear, the pimp from Starsky and Hutch. And oh my, what an unfortunate last name! 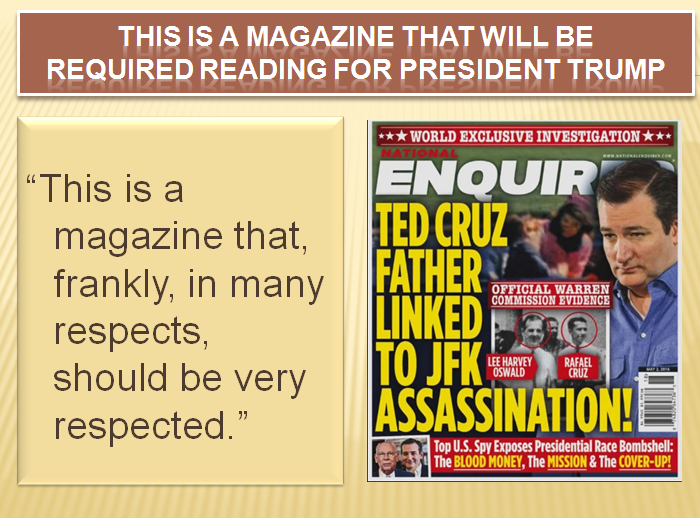 So there you have it, what I believe is the first public ridicule of a truly horrible human being. Definitely a proud moment for me! The blog will be back up and running tomorrow with a post about what I did over my summer vacation! We'll see you then.